Oculus just announced it's lowering the price of its Rift virtual reality headset and Touch controllers across all regions. The price of the Oculus Rift headset is now $499, and Touch controllers are $99 in the US. That's a $100 slash to each. Together, an Oculus Rift plus Touch bundle now costs $598, down from $798 for the whole package. This is much cheaper than the HTC Vive, Oculus' main rival in the high-end VR headset space. The HTC Vive retails for $799/£689/€899. Oculus is also selling additional roomscale sensors for $59, down from their original price of $79. In the UK, the Rift is now £499, down from £549, and Touch controllers are £99, a big drop from their old price of £189. As for Australia, shoppers will find the Rift on sale for AU$549, AU$100 off its original price, and Touch will retail for AU$99, down from $AU219. While Vive is an incredibly good headset and edges out the Rift when it comes to overall experience, the new Oculus price drop could be a game changer when it comes to swaying consumers towards one headset over the other. Today's announcement was made at GDC 2017, during the Epic keynote. 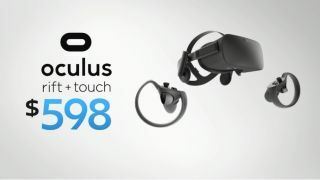 As Brendan Iribe, who heads up Oculus VR's PC efforts, said on stage, bringing down the price of Oculus Rift and Touch is intended to lower the barrier of entry to virtual reality. Though you still need a PC to run Oculus Rift's VR experiences, the price for those machines has been coming down, too. Various Oculus Rift and PC bundles are available through retailers such as Amazon, Best Buy and Microsoft. In addition to the hardware discounts, Oculus and Epic announced Robo Recall, a superbly fun first-person shooter, is now available for free with the Touch.